This Hyde Park home was built in the 1920’s, and had not yet undergone a major kitchen revision. Typical with older homes, the walls and floors were not level. 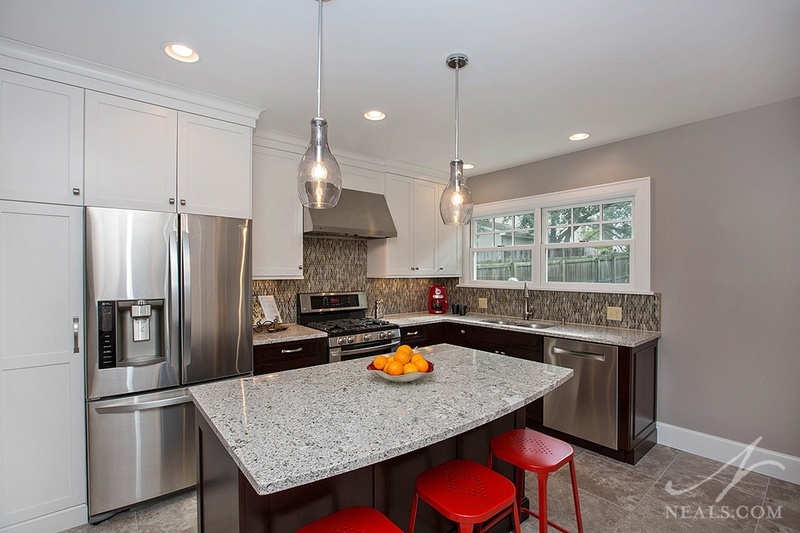 In order to create the new kitchen, the entire space was gutted and rebuilt. Shifting the floor plan around in this kitchen remodel was the key to gaining a better traffic flow and more space in general. After that, the kitchen was given a face lift with modern selections. 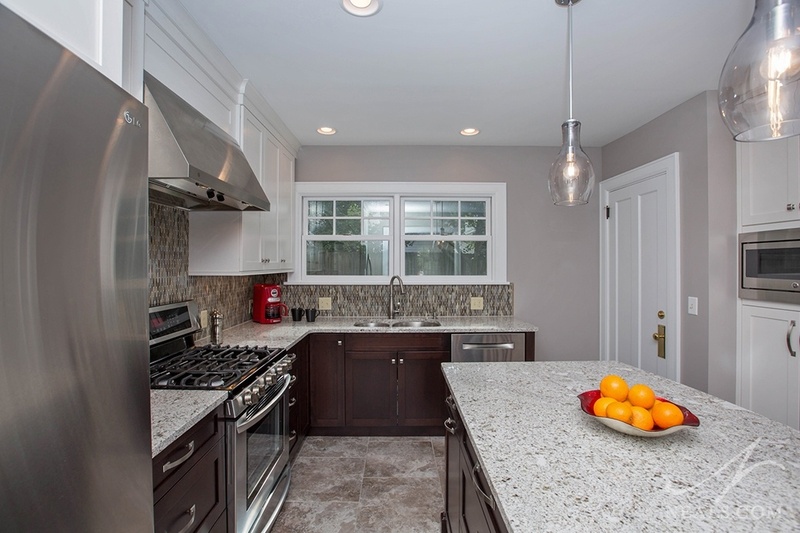 The new contemporary kitchen remodel is now an impressively functional space in addition to being beautifully appointed with a contemporary touch. The original position of the powder room cut off a portion of the total space in this corner of the house, leaving the kitchen with little more than an awkward nook. Since the powder room is the only bathroom on the first floor, the family did not want to remove it entirely. In order to find the space required to open up and fix the traffic flow of the kitchen, the powder room was relocated to the other side of the kitchen. To open the space up to the dining room, and to allow more natural light into both rooms, the original door between them was opened up. This wall is structural. New support beams were included in the relocated hall closet to compensate for the large doorway. After looking at the options, it was determined that removing one of the kitchen windows was the best solution for the kitchen’s new main working zone. This created an uninterrupted wall that spanned the entire length of the room. 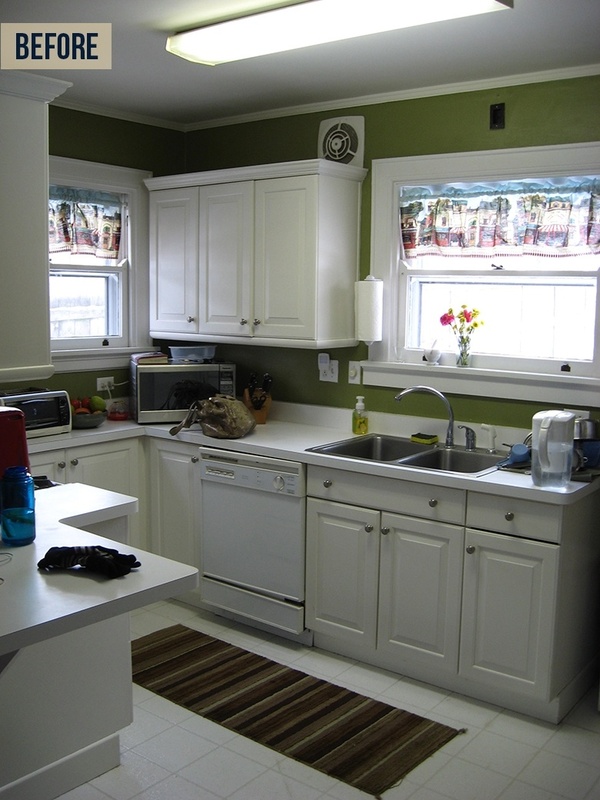 Since the loss of the window would have a negative impact on the amount of natural light coming into the kitchen, the remaining window on the kitchen’s back wall was replaced with a new, double window. As awkward as it was, the original kitchen’s multiple elevations lent themselves well to several pockets of storage zones. The the room squared up into one large open space, it was important to regain valuable storage space in the places where it was possible. A large portion of the storage needs are handled by the new island, since wall space was rapidly maxed out. The other solution was the bank of tall cabinets installed in the original fridge location, which had a similar and effective cabinet design that informed the new, streamlined and updated cabinets. Efficiency is gained in the new kitchen by using a classic L-shaped counter in the corner for the sink and range, and marrying it with an ample island. The island provides an uncluttered, open surface for meal-time tasks. The island sports a bowed edge that accommodates seating. This allows the island to function as an eat-in table, as well as a hub for entertaining guests. The style of the new kitchen marries straight-forward transitional cabinetry with contemporary details. 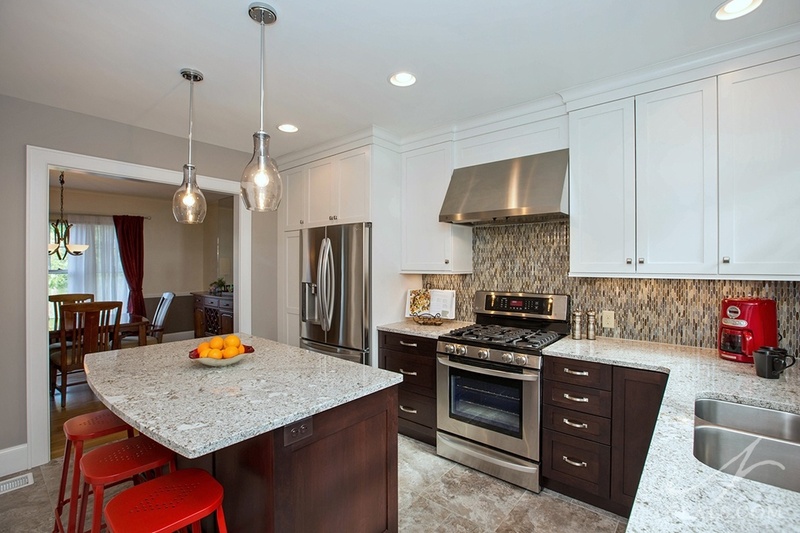 The room is split between white cabinets (wall and tall units) and dark cherry lower cabinets (along with the island). This mix helps the room reflect light from the windows on the top. The darker base cabinets add back in contrast, keeping the room grounded. 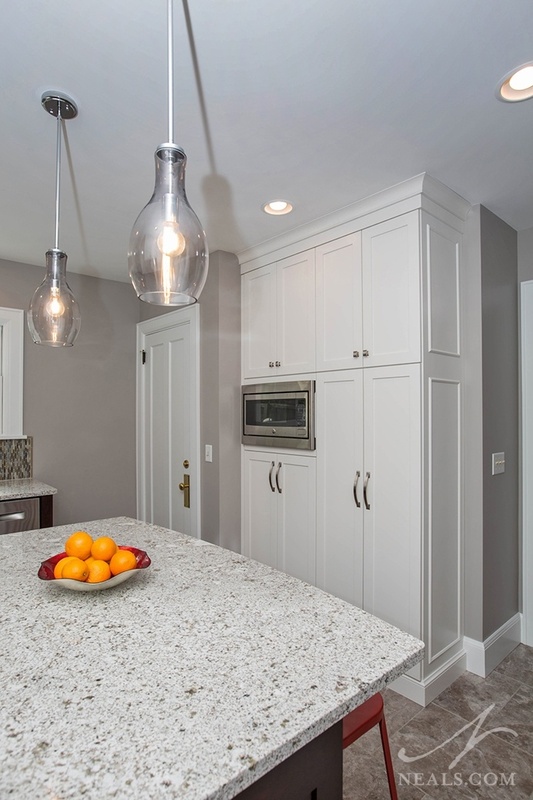 The doors are a shaker-style design with satin nickel hardware. 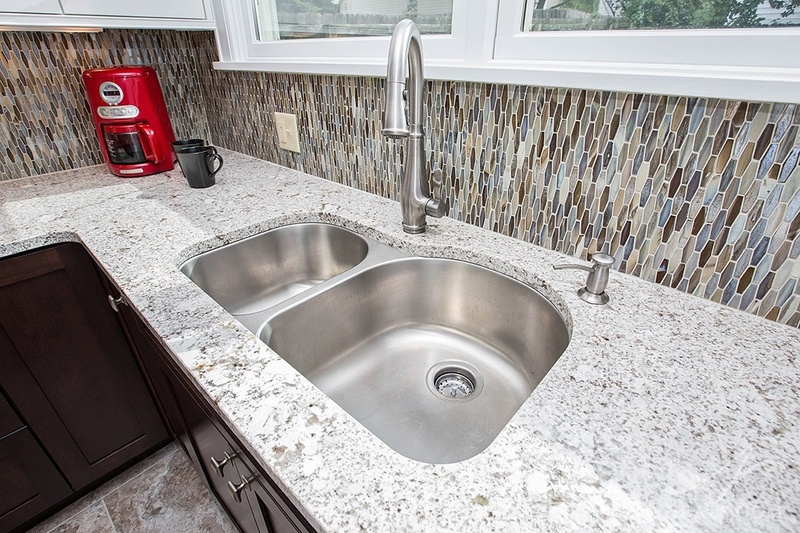 The hardware is a clean and modern shape, and matches the stainless steel appliances. Eye-catching glass mosaic wall tile was used for the back splash. The tiles are unique, elongated hexagon tiles in a random pattern of grays, blues and browns that mimics agate. The tiles were installed vertically to establish contrast against the heavier horizontal line of the counters. When natural light isn’t enough to light the space fully, the homeowner has a few options. 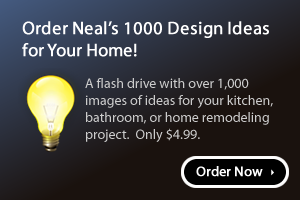 Recessed can lights provide general lighting over the kitchen’s working areas. Task lighting comes in the form of under-cabinet lights that glitter off the glass backsplash, creating a colorful focal point as well. 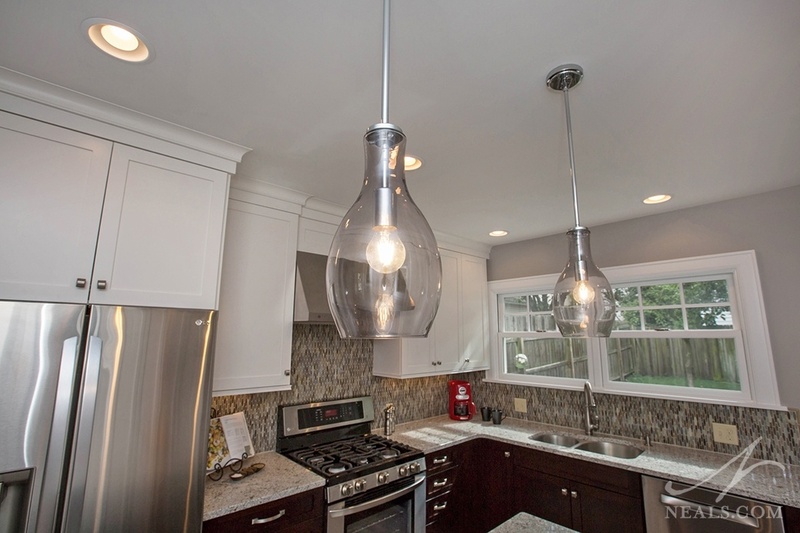 Over the island, a pair of modern, smoke-colored glass pendants provide island task lighting. 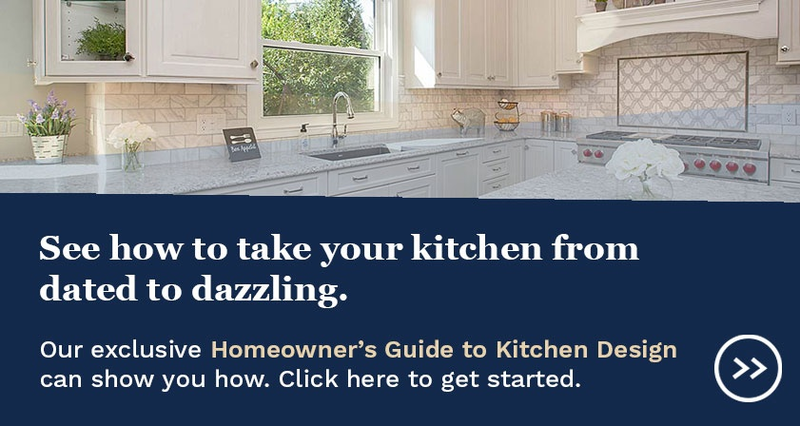 Throughout the kitchen, simple transitional-style trim and molding is used to marry the contemporary look of the space with the pedigree of the home. The result is a well-appointed room with quality craftsmanship befitting the 90 year old home, but with the smart function of a modern house.